Sylvia Plath was very active on Smith College Press Board in the academic year of 1952-1953. In March 2012, this blog listed many of the articles known to have been written by Plath, though largely were printed without a byline. In a letter wholly omitted from Letters Home which Plath wrote on 18 May 1953, she writes her mother that recently she had three articles printed in local papers: two in the Daily Hampshire Gazette with a byline and one, a review, appeared anonymously in the Springfield Union. Two of these three articles are listed in Stephen Tabor's excellent Sylvia Plath: An Annotated Bibliography. That means one was omitted, presumably because its existence was not evident. 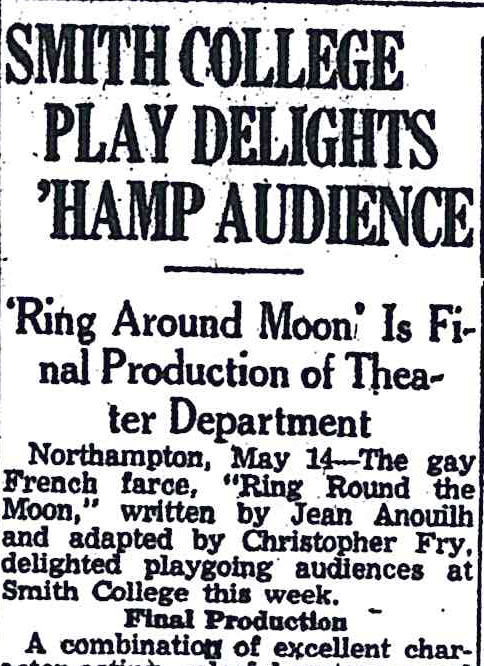 In the first of the articles, and one of the two included in Tabor's bibliography, Plath writes that the Springfield Union piece was a review of the recent Smith College production of Ring Round the Moon, written by Jean Anouilh and adapted by Christopher Fry. This article "Smith College Play Delights 'Hamp Audience", appeared on May 15, 1953, on page 31. (Please note that the review appeared on page 30 of the West Edition of the Springfield Union, too. Those tricky editors were messing with us!) Plath writes that Ring Round the Moon "treats with with a aplomb the central situation of a beautiful and poverty-stricken ballet dancer made queen for a night at a spectacular ball in a palatial chateau." The two Daily Hampshire Gazette articles were printed on May 16 and May 20, respectively. 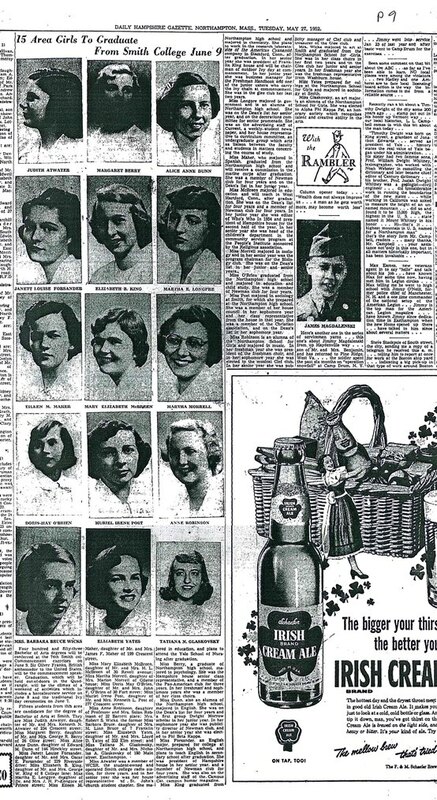 The 16 May 1953 article, also included in Tabor, was"Austrian-born Junior enlists in Women's Marine Corps, 'Can't wait to get there'" about Baldwin House resident Antoinette Willard. Willard fled Austrian on the cusp of World War II in 1939 and became an American citizen in 1944. The article contains a very focused and thorough biographical sketch of Willard. The second Daily Hampshire Gazette piece, actually printed two days after Plath's letter home, was an interview/article on Northampton seniors set to graduate from Smith College. This is the article that has never before appeared in any Sylvia Plath bibliography. 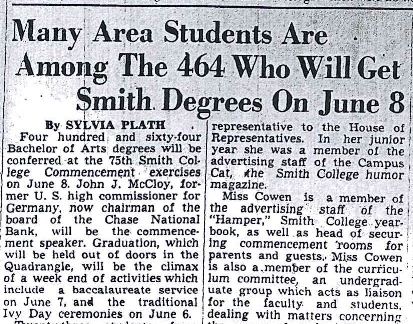 The title is "Many Area Students Are Among the 464 Who Will Get Smith Degrees on June 8" and appeared on a full page spread covering the "75th Smith College Commencement" which was set to begin on 4 June that year. I have a copy of the page from the microfilm and it must have given Plath an immense sense of journalistic pride to see it. from 20 May 1953, p. 8. In the letter to her mother, Plath said she felt these three article showed her versatile skills as a journalist. For the most part, Plath's contributions while on Press Board were anonymous. Her calendar's are filled with references to lectures and events attended and covered for the Board. Many likely were printed. The nice thing about the post I did called "Sylvia Plath was busy...did you know..." is that there was direct evidence found at Smith attributing certain articles to her. With time, more might be found. One thing that post failed to acknowledge was that Plath also served on Press Board in her sophomore year, 1951-1952. My apologies for that oversight. The above 1953 article may not have been Plath's first foray in senior write-ups. Her calendar for 1952 (whilst still a sophomore), held at Lilly Library, indicates that between 8-10 May of that year, she was also doing write-ups, which she called "Senior Personals". 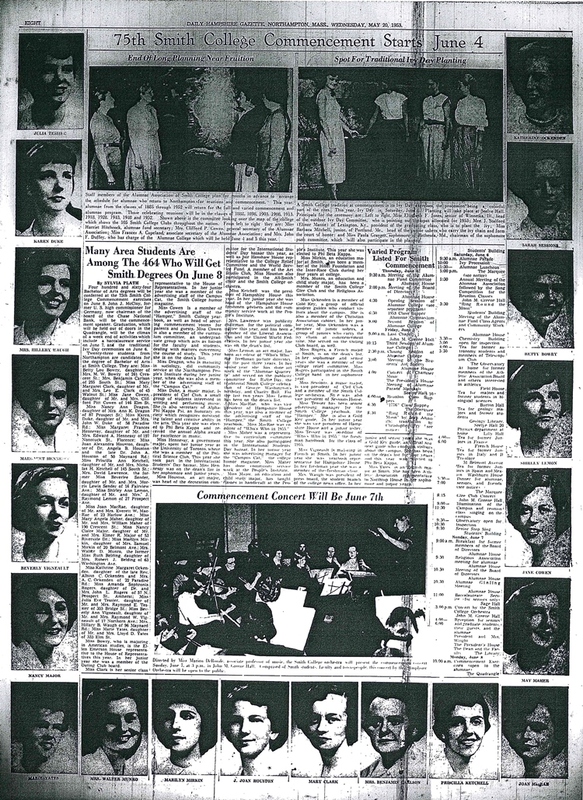 On 27 May 1952, the Daily Hampshire Gazette published an article titled "15 Area Girls to Graduate from Smith College June 9" but no author is stated. As you can see below, it is the same format as the 1953 article and similar content. But being unattributed we cannot say for certain if Plath authored this piece, too. n.b. The original 18 May 1953 letter to her mother mentioned above where these three articles are referenced, that started this blog post to begin with, is held by the Lilly Library, Indiana University. By my rough count there are a total of 738 letters to Aurelia Plath (sole addressee) from 1943-1963 at the Lilly Library. Not all of these letters are in Letters Home. Of those that are in the 1975 book, there are (about) 341 letters to Aurelia Plath; 19 letters addressed to both Aurelia Plath and Warren Plath; 1 to Aunt Dorothy Benotti (Aurelia Plath's sister); 1 to Eddie Cohen; 1 to her grandparents Frank and Aurelia Schober; 2 to Olive Higgins Prouty; 17 to Warren Plath (sole addressee); and 2 to Warren and Margaret Plath; for a total of 384 letters. Letters Home prints, also, two letters from Plath (a postcard and a birthday poem) that do not appear to be part of the collection at the Lilly Library. All links accessed 19 May 2014. In December 1955, Sylvia Plath spent a large portion of her Christmas holiday from Newnham College and Cambridge, England, in Paris, France. Anyway, I was curious about the play, which Plath referred to for the first time in the letter to Wober by its French name. Curious to see if it was possible to narrow down what day she saw it and at which venue, I visited the Microtext department at the Boston Public Library and browsed through the December 1955 issues of the French daily newspaper Le Monde. I found that the play was performed at the theater Comedie Caumartin (25, rue Caumartin, 75009 Paris; map & website). I looked at the newspaper for each day, just to verify the play ran for the entire duration of her stay in Paris. Using Plath's fascinating calendars held at the Lilly Library (Plath mss II, Box 7, folder 6), which are a set of fascinating documents for the detail they provide about Plath's daily activities between 1951 and 1957, I learned that she saw this play on Wednesday, 28 December 1955. Which is curious as both Wednesday's she was in Paris (21 December and 28 December) there was the play was not listed in the newspaper. While she was in Paris, Plath took in other cultural performances, too, including a ballet (Roland Petit's La Chambre and Le Loup) and movies (Les Carnets du Major Thompson, Vive Monsieur le Maire, and Jeanne D'Arc). Can I digress, please? Plath's activities for these years is neither completely recorded nor available… for example there are a few instances where pages of these calendar are missing. Were they removed by Plath herself? By Aurelia Plath who had them in their Wellesley house from circa 1957-1959 until they were sold in the 1970s? By some vandalizing researcher? Going off topic... One of the more chilling moments in working with these calendars is occurs in her 1953 calendar. Firstly, there is a week missing from her time at Mademoiselle, the week of 21-27 June 1953; and then by late July when Plath had two series of shock treatments over three days (on 29 July and 31 July, noted down in truncated form as "SHOCKT"), and then into August when the busyness and the meticulous recording that I had grown accustomed to seemingly, suddenly, slows down. Penned plans turn to tentative faint pencil. The note to call her friend Marcia Brown on Monday 17 August is in hardly recognizable handwriting, which I think illustrates how serious and fragile was her condition and frame of mind at the time. Then the silence that ensues after that, from 24 August 1953 when she attempted suicide and the remainder of the year (she clearly neither had the calendar with her at the various hospitals in which she recovered, nor had any need for it). And there are two missing pages in her 1962 Royal Lett's Diary tablet held by Smith College, which Gail Crowther and I discussed from time to time in our "These Ghostly Archives" papers (links to all of them here). Anyway, back to the point of this post which was the play she saw and enjoyed. Emlyn Williams (1905-1987, obituary) was a Welsh dramatist and actor. Copies of Someone Waiting, published by Heinemann in 1954, can be purchased on ABEbooks.com. Has anyone out there ever read this play or seen it performed? Did Plath ever read the physical book? I am not sure. But she enjoyed the play and you very well might, too. You can see a list of books that Plath read or owned on LibraryThing. All links accessed 11 June 2012, 16 February 2013, 21 April, 1 May, and 8 May 2014. Sylvia Plath Info Blog turned 7 just a few days ago on April 27, 2014! It is hard for me to fathom, still, that it has carried on this long. I sincerely hope the content is interesting, useful and relevant. Sincere thanks to all who visit, comment, and take something away (and not just in the literal sense of those of you who save every post to your computer hard drive!). Since this blog began, there have been nearly 400,000 page views from people spanning 179 countries and territories. It shows how far reaching interest in Sylvia Plath is and it is an honor to try to contribute to that. I am not sure if anyone on the International Space Station has hit the blog or not. Since that first post in 2007, which I still cringe at -- being quite nervous about what the blog would be like, I and several guest posters have contributed nearly 1,000 individual blog posts! "Frieda Hughes on the breakup of her parents marriage"
"Letter from Julia Stiles regarding The Bell Jar"
"Additional News Articles on Sylvia Plath's First Suicide Attempt"
"The Magic Mirror by Sylvia Plath"
There is a natural bias there in that they have been around longer versus some of the more recent posts. "Q: On a scale of 1 to 10 how studly is Peter K Steinberg? As a result of this blog, and my website for Sylvia Plath A Celebration, This Is, I have met some truly remarkable people, as well as some pretty skeevy stalkers. But, hey, I guess "it is what it is"... I hope to keep the blog going for a while longer at least. Posts this year have been a bit slower than in the past as I continue to work on transcribing, proofing, and annotating Sylvia Plath's letters. In working on this project I have learned so much about Plath, gained new respect for her work as a writer and her life. It has been an absolute honor. Similarly, it has been a special privilege to write this blog and all these posts for you, its readers. My most sincere and humble thanks to you all for your interest in this blog. Plath on!